Will installing a programmable thermostat lower my utility bill? The rule of thumb is that switching to a programmable thermostat will lower a homes utility bills by 20% which would lead to an average savings per year of $180. Essentially paying for itself in the first year allowing the homeowner to enjoy the future savings. Even if that sounds optimistic to you it makes sense that your heating and air conditioning not running for eight hours a day for five days a week will lower your utility bills. That adds up to 2,080 hours a year that your furnace and air conditioning will not be running extending the units life expectancy. 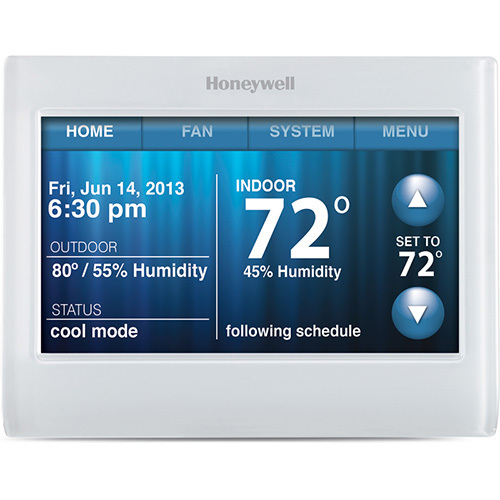 Are there different kinds of programmable thermostats? There are a several different options and choosing the right one is up to you but there are a few basics to know before making your decision. First, there is the 5-2. This will work for you if your schedule is a predictable five-day work week and off on the weekends. It can be programmed to match your work schedule so you are saving money while you are not home. If you are looking for a little more flexibility than the 5-1-1 is what you need. This type can be set for the five-day work week and then can be adjusted to match the busy weekend. Lastly, there is the 7 day. It can have a different schedule for everyday of the work. All three are available with WiFi capability so it can be checked or adjusted from your phone or any computer with access to the internet. How do I know it is time to replace my thermostat? Basically, your thermostat is a switch to turn you HVAC system on. When it no longer controls your HVAC system then it is time to replace the thermostat. Before trying any troubleshooting you should consult with a HVAC professional. Your HVAC system will not turn on? Find the control wires for the thermostat and disconnect them. If you touch them together and the HVAC system comes on then it is your thermostat. If it doesn’t, then it is your HVAC system. HVAC system will not turn off? Disconnect one of the control wires and if the system goes off it is the thermostat. If it doesn’t, then it is the system. If you have more than two wires then you will need to look into the system’s documentation or consult with a HVAC professional. If I turn my thermostat to the highest or coolest temperature, will it heat or cool my home any faster? It will not. The furnace or air conditioner can only work so fast to change the temperature in your home. If the temperature in your home is 55 degrees and you want to warm it up to 70 degrees it will not warm up any faster if you set the thermostat to 90 degrees or 70 degrees. Setting the thermostat to an extreme will not heat or cool your home any quicker. It is possible you could waste energy and money if you leave it set at that extreme for too long. It is best to set the thermostat for a reasonable temperature and then adjust it a couple degrees either way, if necessary, to suit your comfort level. The batteries should be changed approximately once a year. A good habit to get into is to change the batteries at the beginning of the cooling or heating season so a routine is maintained. Are there any rebates available if I replace my thermostat with a programmable thermostat? How should I set my thermostat if I have a two-story home? Two-story homes have a problem that homeowners have been tackling for years: it’s always significantly hotter upstairs in summer, and colder downstairs during winter. Setting both your upstairs and downstairs thermostats to the same temperature usually doesn’t resolve this problem. Instead, during the hot summer months, turn your upstairs thermostat to your target temperature and your downstairs setting to two degrees warmer for optimal comfort and efficiency. Reverse this process in winter and you’ll enjoy comfort while using less electricity all year round. The rebate combined with savings from adding a programmable thermostat should easily cover the expense of having one installed.